7" by Alicja Trout (Lost Sounds,Nervous Patterns, River City Tanlines, Mouserocket, Clears, Fitts just to name a few of her bands!!). "Lights" is almost a warp back in time to the phantastic "You Can't Change" 7" by the Nervous Patterns. Melodic, yet aggressive. B Side "Can't keep my hands of you" was mastered by someone from the DEVO circles and has all kindsa weird effects in it! NICE!!!!!! Alicja is undoubtedly the most productive and prolific person in punk rock. 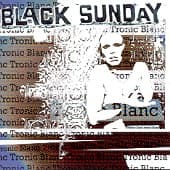 Somehow, she managed to find the time to record the masterpiece 'Tronic Blanc.' Melding the paranoid, futuristic keyboard buzz of Lost Sounds with the haunting pop sensibilities of Mouserocket, 'Tronic Blanc' features intense art-rock workouts alongside sprawling, lush soundscapes and aggressive noise rock colliding with melodic pop hooks. Following the shockingly abrupt breakup of Lost Sounds, Black Sunday fulfills the promise of that band, offering punk fans a glimpse of what's next.